We’re on day four of my comprehensive review of the 9-disc Star Wars Blu-Ray box set, so you know the drill by now: As explained in this post, I’m reviewing the set disc-by-disc, and today, we continue by analyzing the contents of Disc #3, which contains Episode III: Revenge of the Sith. I’ll review the film itself, discuss the video and audio quality, extras, and more, a trend which will continue throughout the week as we continue through each disc in the set. 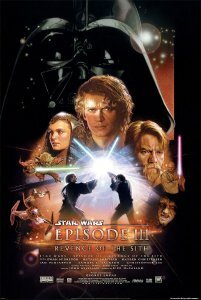 In the past, when discussing the Star Wars prequels, I’ve always been hard on “Revenge of the Sith,” using it as an example of all the structural problems with the trilogy: we don’t get to see the majority of the Clone Wars, Anakin is never shown to be a great hero nor are we given a reason to care about him, his transformation to the dark side comes very suddenly and without much buildup, etc. etc. Marathoning the prequel trilogy as I have done this week, however, I realized my opinion of “Episode III” was far too harsh. All the problems I listed above are legitimate, serious flaws, but they are flaws in the structure of the trilogy, not in the fabric of “Episode III” itself. “Revenge of the Sith” opens exactly where it needs to as a climactic third chapter, and it barely misses a beat from beginning to end. It’s an extraordinarily powerful conclusion, but in an odd way, its strengths highlight all the flaws of episodes I and II. For instance, Anakin and Obi-Wan’s final battle is already emotional charged, but think of how much more heartbreaking it would be if Episode II had really shown this duo as great friends? Similarly, Anakin’s descent into darkness feels abrupt here, but not by any fault of “Episode III” – the earlier chapters needed to give Anakin greater motivation. In the same way, Anakin’s downfall would be much sadder if there had a come a point in the earlier films when we actually liked and rooted for him; the end of the clone wars would mean more if we’d actually seen some of the war beforehand, the destruction of the Jedi would have more impact if we’d gotten to know them better in earlier chapters, etc. etc. These are all failings of Episodes I and II, not of Episode III, and in that way, watching “Revenge of the Sith” only makes it abundantly clear that “Phantom Menace” and “Attack of the Clones” were narratively insignificant wastes of time. Judged on its own merits, separate from the failings of its predecessors, “Revenge of the Sith” is a legitimately great movie. George Lucas can talk about the cohesiveness of his saga all he wants, but he clearly heard the complaints about parts 1 and 2, and he took major steps to rectify those flaws. Where Episode I was meandering, “Sith” is fast-paced and assured; where “Episode II” was boring, “Sith” is engaging on every level. Where earlier films featured terrible dialogue and shaky direction, Episode III boasts a strong script (minus a few choice lines, of course) and confident direction. Performers formerly wasted are used to the film’s advantage this time around, and there’s not a single area of the movie that doesn’t show vast improvement over the other prequels. Even Hayden Christensen, bane and destroyer of film two, must be commended for learning how to act in the interim. His performance here is infinitely better than his first go-round, and I don’t want to sell that improvement short. Nevertheless, Christensen is still the weakest by leaps and bounds, struggling more than his peers with the dialogue and completely incapable of nuanced expression; by the end, I never fully believed that this man became the legendary Darth Vader. Christensen was, I think, mis-cast from the start, and with that in mind, his work in this film is somewhat impressive. The real failings of Anakin have always laid in the writing, and such is still the case. Anakin starts film three in a dark place, and we’re never really meant to like or sympathize with him in this chapter. I think that’s a fair narrative choice – films one and two are where we should have grown to love the character, thus adding impact to his downward spiral here – but nevertheless, it underlines the fundamental, ultimate failure of the prequels: that Anakin Skywalker is never as great as we were led to believe in the original trilogy, never doing anything to earn the admiration Luke grants him when saying “I am a Jedi, like my father before me.” In fact, since the council refuses to make Anakin a Jedi Master in this film, Anakin was never actually a Jedi, but I digress. These developmental problems with Anakin are really the only notable weakness of “Episode III,” and even then, I do like Anakin’s arc within the confines of this film. The desire to save a loved one is something we can all relate to, and since Palpatine has always been kind to Anakin, always willing to boost his already inflated ego, it makes perfect sense that Anakin would buy into Palpatine’s lies about the dark side. It’s even more fascinating to watch how Palpatine fools Anakin into hating the Jedi order, especially if you look at the Clone Wars – a conflict fabricated entirely by this one very evil man – as an elaborate hoax to give credence to Palpatine’s lies, lies that manage to fool not only Anakin, but the majority of the republic. Palpatine doesn’t even have to ‘overthrow’ the established government to take power – he merely transforms the existing Republic into the Galactic Empire, and is applauded for it. There’s really no doubt in my mind that Palpatine’s plot is one of the greatest slow-burn evil masterplans in cinematic history, and so much of the fun of “Revenge of the Sith” comes in watching how completely and effortlessly Darth Sidious takes over. And that’s only one part of the vast, rich story contained in this film. With the Clone Wars themselves winding down, we get a lot of great material with Obi-Wan Kenobi and Yoda as they take on missions to finish the fight. In the end, all roads lead back to Sidious and his new apprentice, Darth Vader, but Lucas handles a large tapestry of characters, locations, and subplots with confidence and clarity, something that cannot be said of the other prequels. Apart from Christensen, the entire ensemble is on fire this time around. Ewan McGregor still steals the show as Obi-Wan, and I love how he subtly tweaks his performance with each film to bring the character closer to Alec Guinness’ iconic portrayal. Ian McDiarmid brings the Emperor full circle in brilliant fashion, and manages to make his calm, collected Palpatine personality just as frightening as Sidious’ true nature. Frank Oz may not have been puppeting Yoda at this point, but vocally, his final turn in the role is a memorable send off to the character. Natalie Portman isn’t given a whole lot to do this time, but she does a great job with what she is given, and that includes some of the bad dialogue. There are only a few problematic conversations in “Revenge of the Sith,” but even then, Portman has mastered her craft so completely at this point that she manages to class up even the cheesiest of lines. It should also be noted that “Sith” features one of the all-time great John Williams scores. His work on the other prequels was very strong, but his work on “Episode III” is a real masterpiece. Fully cognizant that this would be his last time ever scoring a Star Wars film, Williams masterfully mixes all the major motifs from across the entire saga in with an amazing assortment of new material, including one of my all-time favorite film compositions, “Battle of the Heroes,” which plays over Anakin and Obi-Wan’s fateful duel. And at the end of the film, Lucas more or less hands the narrative reigns over to Williams, who uses Leia and Luke’s original themes to signify the focus away from Anakin and towards his children. Genius doesn’t even begin to describe it. This score is both a fitting companion to “Sith” and a love-letter to thirty years of classic Star Wars music; suffice it to say, it’s one of Williams’ greatest achievements. Given the failures of Episodes I and III, “Revenge of the Sith” has no right being as good as it is. From start to finish, it’s full of powerful culminating moments, and the last act just pummels the audience in the heart over and over again. This is the kind of legendary story we all had in our minds when we heard Obi-Wan and Yoda tell Luke the story of Darth Vader in the original trilogy, and the last ten minutes, where Lucas brilliantly moves us out of the prequels and into the original “Star Wars,” finally achieves the full potential of the prequels (minus Vader’s hilarious “NO!” of course). I’m not sure if “Episode III” fully redeems parts 1 and 2 – after marathoning the trilogy, I have no desire to ever watch the earlier films again, yet I can’t wait to revisit this one – but it’s a very good film in its own right, and a fitting, dark conclusion to the “Star Wars” saga. In a word? Perfect. Like “Attack of the Clones,” “Revenge of the Sith” is an all-digital production, and that means there’s no film stock that could have degraded over time and potentially held back the image. We’re getting a 1:1 copy of the original digital file, and since “Sith” represents a pinnacle of digital filmmaking, the results are absolutely spectacular. As I discussed in the film review, so many sequences are simply bursting with activity, and on Blu-Ray, you can see every last detail, down to the tiniest ship zooming around in the background. It’s very surreal to see an image this deep and detailed, especially considering how well the effects hold up six years later – they all look entirely realistic, as though we are watching these space battles and lightsaber fights from a (very clean) window, rather than through a television. The colors are startlingly vivid, the contrast strong and deep, facial tones accurate and lifelike. If you’re looking for demo scenes, the opening battle over Coruscant is a great choice, as are the brawls on Kashyyk and Utapau. Not an inch of this image rings false, not even for a frame. It is simply a flawless transfer, and I would gladly watch the film through on mute just a foot or two away from the screen, just to appreciate all the artistry on display. I’m running out of ways to describe the audio tracks on this Blu-Ray set. Once again, the DTS-HD track for “Revenge of the Sith” is a masterful recreation of the theatrical experience, one that makes full use of the surround channels to immerse the listener. This time around, I think I was most impressed by the sounds of the lightsabers; there’s such a palpable weight to the lightsaber sound effects that the audio adds an essential layer of engagement to the duels, something I never fully appreciated until watching the film on Blu-Ray. As always, the music, sound effects, and dialogue are all perfectly balanced, so much so that I don’t think I hit the volume once from start to finish. Perfect marks once again. All the discs in the set feature identical menus and presentation – the only differences are the choice of clips and music played. As I explained before, the menus are unexciting but very efficient. As always, we are given a choice of two commentaries: the first is the original audio commentary with George Lucas, Rick McCallum, Rob Coleman, and Roger Guyett, from the 2005 DVD release, and the second is a new “archival” commentary cobbled together from ‘vintage’ (circa 2005, that is) interviews and sound-bites. Both are good tracks, but once again, I prefer the archival track for the variety of voices and breadth of anecdotes we get to hear. Interestingly enough, the archival commentary closes with Samuel L. Jackson reminiscing fondly, saying he’s glad he did “Star Wars” because it’s something people will be watching forever, ensuring he’ll be remembered. Hmm. I find that most people forget Jackson was even in these movies, but hey, if he thinks more people will be watching “Revenge of the Sith” in the year 2100 than “Pulp Fiction,” more power to him. Thank you for this wonderful review, Jonathan! RoTS is arguably a masterpiec in its own right.